Roll on all the events for 2018! Lois has been running wear it pink for 4 years at St. Catherine school and is getting excited for 2018’s day as well as offering top tips for your event! Our wear it pink week! There was a different event happening every day during the week of 16 October 2017. We held a Krispy Kreme Doughnut sale, a form activity, several quizzes, fancy dress items for sale, Breast Cancer Now merchandise for sale, sweet and popcorn cones for sale as well as two raffles and lots more…. 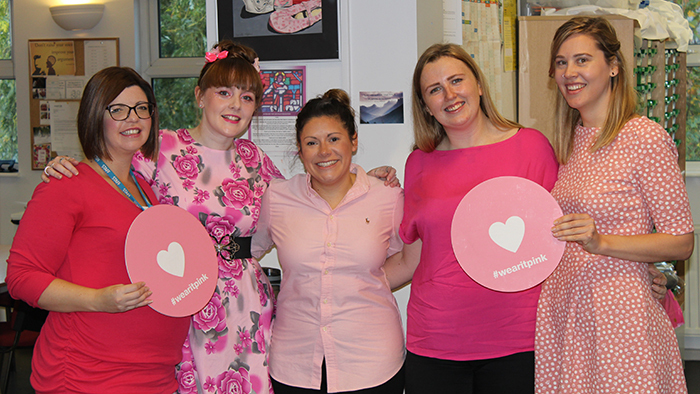 On Friday 20 October, we had our wear it pink non-uniform day, where we also held a staff best dressed competition. We also drew our staff and student raffles on that Friday with the help of our Head teacher, Mrs Connolly. We also decided to do something a little different. I tried to get to as many students and staff members as possible who wanted to write a message on the wear it pink whiteboards that the team at Breast Cancer Now had sent out. I photographed everyone involved and we put together a little video to show our school community the personal reasons why we support the charity. It was such a lovely activity to run and I think everyone enjoyed being able to share their story. 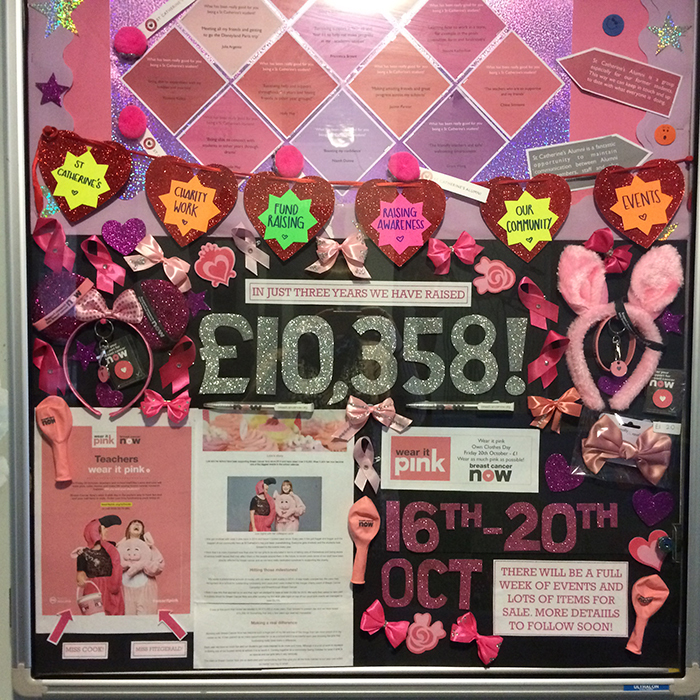 Wear it pink has grown in terms of activities and money raised each year at our school and it never fails to amaze me just how generous people are. Over the course of our pink week I gave away over 100 prizes. There are several companies who have been supporting our Breast Cancer Now fundraising since it began in 2014 and we really appreciate their dedication in helping us. Without them we would not have achieved our original goal of raising £10,000 and we are now even more determined to continue raising money for Breast Cancer Now. Our final total from our week of fundraising was £1,967.70! All the fundraising items we received in the pack were really helpful, especially as myself and my friend Laura featured on the front cover! This was so unexpected for us and we could not have been more proud to represent our amazing school. It was great to be able to show our students that because of our fundraising efforts our school was being noticed and we also featured in several publications including My Weekly, Now Magazine, Best Magazine, Inside Soap, Jamie Oliver, TES and The Verve. 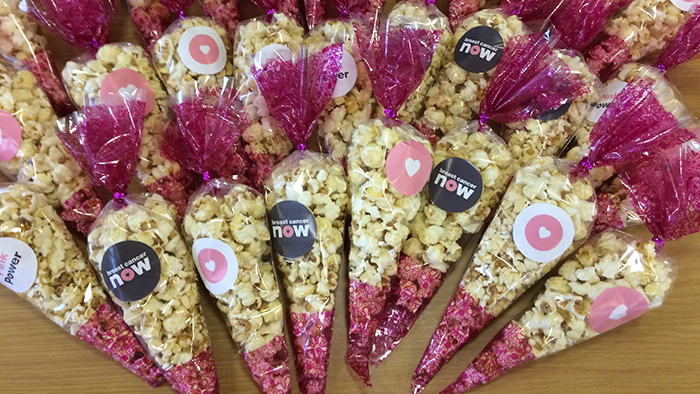 I tend to keep hold of any items we haven’t used previously so I had some stickers for 2017’s event which we branded the sweet and popcorn cones with as well as giving them out to everyone. The posters are always great to use to fill in the details about your event and they are ready to go. I also put up handmade posters around school with glittery stickers and things on them so that they stand out. The cardboard money boxes are also helpful as they are flatpack and it adds more pink to your table and event. I had ordered quite a few so we had some boxes on our reception, in the staffroom and in the main hall. I was so overwhelmed by the generosity and the amount of raffle prizes that were donated for October’s event, I decided to hold onto some of the items to do a Christmas raffle for staff as a last fundraiser for 2017. On Wednesday 20 December, we held the raffle and I had over 35 prizes to giveaway. Our friends at the Tesco centre donated some gift cards and so I purchased a Christmas Food and Drink Hamper. Our local Wimpy Restaurant also donated a huge £50 voucher as well. Our staff managed to raise a whopping £233, thank you once again to our teachers and support staff who always dig deep to support these events. 19 October 2018 will mark my fifth wear it pink fundraising with Breast Cancer Now. Those 5 years have flown by and it is safe to say that wear it pink is not only a huge part in my life but also in our school life. From the very first event that I took on in 2014 I knew that we had become part of something much bigger, spreading awareness about an issue that affects so many lives and as an all-girls school I knew that we could do so much more. The whole school has been behind my pink fundraising madness every step of the way with our ongoing journey supporting Breast Cancer Now, and this is the best form of motivation. The countdown begins for Wear it pink 2018 – get involved. It is never too early to start planning- I usually tend to start getting in touch with companies and people in the summer. It has been 4 years that I have been running wear it pink at St Catherine’s and each year gets easier in terms of organising as I tend to reuse and update/amend the resources that I have used the year before. I always send out a PowerPoint each year which includes new facts and figures about the charity as well as a video which show photographs from what we got up to the year before. This is a useful tool for our Year 7’s as they can get a flavour of what to expect for the upcoming event. If you are prepping resources like quizzes and things, google for ideas as there are so many things out there that are already prepared and ready to go. Be efficient with your time and keep your resources simple and clear and easy to use. You can also go out into your local community and get talking to people about what you are doing. The support from local businesses has been vital to our success and even more importantly keeping that relationship. I always keep in contact with anyone who has helped us in any way and send thank you letters, photographs and copies of our newsletters which feature any of our work with Breast Cancer Now. Try to get a rough idea about what events are likely to be a success and try and work out the numbers of things that you need. I try to ration the items out between the year groups in terms of what I think they would like to purchase. The wear it pink team at Breast Cancer Now are so helpful and sent us out a load of badges and pens so that we had enough for every child if they wished to purchase. The Breast Cancer Now merchandise is always popular so make sure you put an order in early. I have already started to collect prizes and pink items in anticipation for wear it pink 2018. Now that my colleagues are used to my events they are very kind in that people are often giving me unwanted gifts and things they have picked up knowing that I will be able to use them for Breast Cancer Now. We have now raised £12,560.86 in 4 years so it would be fantastic if we could reach £15,000! St Catherine’s definitely put the FUN in Fundraising. Roll on all the events for 2018!